We have seen that in the fabrication of an IC the geometry and the doping of the various layers must be chosen to optimize uncharacteristic of the transistor which is the most important device. It is not economically feasible to provide extra processing steps to fabricate diodes. Therefore diodes are generally transistor adopted for this operation. There are basic five configurations of transistor for diode operation as shown in the figure below. A base-collector diode is shown in figure [a]. The emitter is floating and can be omitted. This diode has a high breakdown voltage Â of around 50 V. However it has a relatively long switching time of about 100 nano seconds due to the collector access resistance Rcc, which is nothing but the resistance between the collector terminal and the effective active region to which it is connected. (This resistance is reduced by buried layer diffusion). The switching time can be improved to about 70 nano seconds by shorting the emitter and base to remove charge stored at that junction, while retaining the high breakdown voltage, as shown in figure [b]. Figure [c] shows the base-emitter junction diode with collector open. The turn-off time, due mainly to charge stored in the base collector junction is about 80 nano seconds and it has a low breakdown voltage (associated with the high doped emitter of around 5V. In above case, the switching time can be reduced to as low as 20 nano seconds, by shorting base and collector, to remove minority stored charge as shown in figure [d]. The low breakdown voltage is not affected in this diode. Figure [e] shows the diode connection where both emitter-base and base-collector junctions are in parallel. It is obtained by shorting emitter and collector. This diode is not much used due to high junction capacitance which causes low switching speed of around 150 nano seconds, together with a poor breakdown voltage of about 5V associated with the base-emitter junction. From above discussion we conclude that diodes shown in figure [b] and [d] are most useful, the former for higher voltage applications, and the latter where switching speed is of paramount importance. Supply voltage encountered and digital ICs rarely exceed 5 or 6 V, hence the limitation of low breakdown voltage of diodes shown in figure [d] is not a serious disadvantage. Further it has the lowest series resistance and no parasitic p-n-p action to the substrate (which occurs between the substrate and the p-type base, if the collector-base region of the n-p-n were to become forward biased). Also it has generally the lowest forward voltage drop for a given forward current, lowest storage time and lowest reverse-bias capacitance. These all favourable factors make the diode of figure [d] an ideal choice for digital ICâ€™s. The avalanche breakdown characteristic in a reverse biased diode can be used for voltage reference or the dc level-shift purposes in IC circuits. The base-emitter breakdown voltage which falls within the 6 to 9 V range is the most commonly used avalanche diode since its breakdown voltage incompatible with the voltage levels available in analog circuits. The breakdown voltage of base-emitter junction of above diode exhibits a positive temperature coefficient, typically in the range of +2 mV/Â°C to +5 /Â°C. 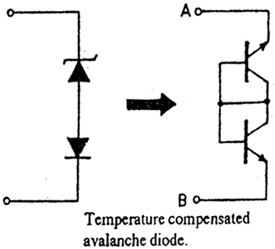 By connecting a forward-biased diode in series with avalanche diode, it is possible to partially compensate the thermal drift of avalanche diode because the thermal drift of forward voltage of the series connected diode is negative. The composite connection is shown in the figure below which has breakdown voltage of (VD + BVEB) with significantly reduced temperature coefficient. Here VD is forward drop of series diode and BVEB is the breakdown voltage (BE junction) of avalanche diode. As the figure shows, the composite connection consists of two transistors back-to-back in diode connection. Since both transistors have their collector and base regions in common, they can be designed as a single transistor with two separate emitters. The barrier is only half as large as that of a junction diode, at low current, a Schottky diode has a forward voltage drop of only about 0.3 V to 0.5 V.
Only majority carriers are involved in the conduction mechanism, which make the Schottky diode a very high speed device with a recovery time less than 1 nano seconds. The Schottky effect only takes place in relatively high resistivity semiconductor material. When the semiconductor is heavily doped, a tunnelling effect occurs which provides a direct ohmic contact. 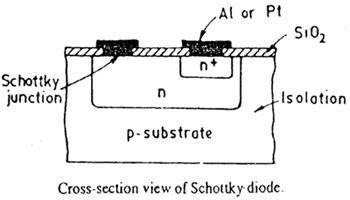 The figure below shows the cross-section view of a typical Schottky diode. It is formed between the epitaxial layer and the Al deposited for interconnections. The cathode connection to the epitaxial layer is through a conventional n+ collector contact diffusion, to ensure a good ohmic contact, but at the anode connection the n+ diffusion is omitted due to direct ohmic contact provided by Schottky junction. The Schottky barrier is formed between aluminium and the n-type epitaxial silicon. The advantage of Schottky diode is that it can be made with existing IC processes. No additional manufacturing steps are required. This is important from yield point of view. One important application of Schottky diode is Schottky diode clamped transistor is shown in the figure below. The figure [a] shows circuit symbol and [b] shows the cross-sectional view of Schottky transistor. The Schottky transistor is used in TTL logic circuits. The Schottky transistor provides very fast speed operation. This is possible because the Schottky clamp prevents the transistor from going into saturation. If an attempt is made to saturate this transistor by increasing the base current, the collector voltage drops, diode D conducts, and the base-to-collector voltage is limited to about less than 0.5. V. Since the collector junction is forward-biased by less than the cut-in voltage (0.5 V), the transistor does not enter saturation. Note that in the figure [b], the aluminium metallization for base lead is allowed to make contact also with the n-type collector region, but without an intervening n+ layer. This results in formation of metal semiconductor diode between base and collector. Since the Schottky junction is formed during the metallization process, the Schottky transistor requires the same number of process steps as does an n-p-n transistor. For practical Schottky diodes, the dominant reverse current component is the edge leakage current which is caused by the sharp edge around the periphery of the metal plate. To eliminate this effect metal semiconductor diodes are fabricated with a diffused guard ring as shown in the figure [b]. The guard ring is deep p-type diffusion and the doping profile is tailored to give the p-n junction a higher breakdown voltage than the metal semiconductor contact, thus preventing premature breakdown and surface leakage.